I never intended to be away so long, but I know enough to know that’s just how it goes sometimes, especially this time of year. First it was Christmas, and then it was technical issues on the computer, and then it was the opportunity to spend New Years away, just us five. We grabbed it with two hands — yes, we did. It’s been lovely to be away, but I’ve missed you. I’m behind on so many things: the trees and all the decorations still fill the house, scatterings of vacation mess cover all surfaces, but I’m feeling caught up on some of those things that matter most. Listening to people I love. Eating delicious meals around the table. Writing love letters to my girls. The longer I’m away from this screen and the blinking cursor, the more I struggle to come back and write, the more I need to choose the Voice that is greater than the siren song of perfection. I might be struggling with the lie that because you haven’t seen me in a while, I need to make some sort of dazzling grand entrance. Well, I don’t have one of those today. Just me in my cozy wrap (though if I can say it straight, it is quite a luxurious Christmas gift from my mama who imagined my writing mornings like these, and I can barely take the thing off). And I’m here with bad-looking bed head, trying to ignore the girls’ random mess that covers my desk. This morning, only a few sunrises into the new year, I’m getting ready to lace up shoes and head into the woods on a hike with my friend. We’ll have a young buddy spend the night. The Christmas trees will need to wait a little longer. And I just had to meet you. At least in our corner of the world, we approach this year extra squishy or is it extra firmer and rounder around the middle, things a bit of a wreck (have I said that already? ), feeling a little unmoored from some of the places we’ve traditionally found our place. Things look different than I might have expected when I stood on the cusp of 2013. I’m not sure how you and 2014 are getting along so far. Are you hopeful, weary, pared down or confused as you look at the blank canvas of the year? Me — I feel lots of things, including a vague awareness of being on the cusp of changes. When 2014 draws to its close, Michael and I will be 40, we will have three daughters in all-day school. Lots will have shifted in ways we can’t anticipate. And in my writing life, too, I feel the shifts. Well, in 2013, my anti-resolution, pro-intention word was trust. It was a significant choice for me, and I plan to write more about that, but one of the biggest shifts trust brought was experiencing the good of simply showing up — as the created me and my life, not some imagined me that I think you all would want to know. As a writer this has meant prayerfully looking at opportunities as they’ve made their way to me, writing when I felt led and knew I must. It’s meant releasing my “writerly identity” as something I need to own and manage and wrangle. It’s meant trusting there’s a reason for this voice of mine, this presence of mine because God has asked me to share who and what he’s made me, sparkles included or excluded, among the chorus of voices declaring what is good and true. It’s not like I throw trust to the curb now that 2013’s closed. In fact, I read just this morning Jesus’ invitation to “Trust me.” Those words that became my mantra and shaped my year in meaningful ways, how I need them still. This year, continuing to live in a place of trust, I feel the pull to move forth, to explore, to expand on a sense of purpose and vision beyond showing up alone. To seek, though I don’t know exactly what that means. I do know that God’s dropped the word SEEK right into my lap. Though I considered words like “forward” and “onward,” they felt as if they may become too effort-filled and perform-y (what? that’s not a word?). “Seek” seems to me like an attitude of the heart, a deepening, a listening process, a willingness to move without feeling like I need to make it happen. Anyway, that’s where I am today, friends. I’d love to know how you’ve been. I’ve really missed you. Have you considered choosing a word to guide your year? I’d love to know if you have (or not). Looking forward to 2014 with you, so grateful that I count you among some of life’s sweet blessings. Hello my friend! I’ve missed your words and your heart. And I love your thoughts on “seek” – a willingness to move without feeling the need to make it happen. That resonates so deeply with me. So glad you showed up here today, right where you are. Beautiful and inspiring. Dana, you are a born encourager, friend. I pray that we will be able to continue to have the openness of heart to receive what is good, in spite of it not taking the shapes we expect. I love you, girl. Hugs to you, Brenda. So thankful to see you here today. I’m saying a prayer for you right now — imagining you in your cozy robe, finding a bit of comfort in a simple thing in the midst of sickness. I sense your heart for loving your family and pray that you’d find great joy in them. And may you know the peace that passes all understanding as you walk this painful and beautiful journey of life. Grateful to “meet” you. Thank you so much for your kind words. I would not be alive today without my faith. Depression wreaks havoc from time to time but most times Jesus holds my hand. Sending hugs and hope we can commit to one another in His name for some time to come. Ahhhhh, I love that Julian of Norwich quote like a deep breath. Lovely to hear how the trust deepened into trust Me and shaped you. Thank you, Ashley. Thank you, Summer. I’ve missed being in touch. Isn’t that quote just wonderful? It has such a calming effect on me, too — as you said, “like a breath.” It feels very much like another version of “Be still and know that I am God.” One of those truths I need to continue to return to over and over again in order to recognize both my loved-ness and small-ness. So missed your voice here! Grateful you’ve had time to soak up your people and relish them in this time of being away. It’s meant trusting there’s a reason for this voice of mine, this presence of mine because God has asked me to share who and what he’s made me, sparkles included or excluded, among the chorus of voices declaring what is good and true. Mainly because it speaks to my word: Brave. I’ve missed you, too, Lori! And I must argue, I do believe you are brave. And, too, I look so forward to seeing how God brings out more of that brave beauty in you this year. So glad we get to sing in the chorus together. It’s so lovely to see you and hear you again here. I’ve missed your voice, and yet, I know, too, that this is the way things go at times. I seem to be in an “away” season with my writing. But from your gorgeous photo and your one word for the year, I felt an immediate sense of peace and longing, like I want to be there with you, too. Seeking, in an attitude, not a sense of perform-y-ness :-). I feel so grateful to begin another year, sweet friend, another year of watching where God takes us and shapes us and heals us and spills us out. I count you as a blessing. Dear Amber, I cannot wait to see you a week from today. AHHHHHHHH! On a less crazed note, I feel it too: that sense of both longing and be-longing. Thank you for that echo. I know that writing lives wend and weave through time and space, but I just want you to know that I sense so much in you the good of both your writing time and in your living a life worth writing about. You are such a spiller out of good. I love you, friend. Happy to see you back again and happy to hear about your time “away”…loved the photo of your family! Thanks for being here for us/me…I am planning on “mindfulness” for my one word this year – and I liked the umbrella suggestion on the one word site. Always grateful to “see” you, Martha. I also LOVED the photos of you and your family. What beauties! “Mindfulness” — what a phenomenal word. My friend, Deb (see comment below) also chose mindfulness. I love that! And my mom chose “present,” which seems very connected to that idea. I love those overlaps, and you are all about the same age with children in very similar stages of life…anyway, what a great focus/intention for your year. I’ll have to check out the umbrella idea on the site. Blessings on your 2014! Happy New Year, Deb. Haven’t these recent sunrises and sunsets been exquisite!?! I don’t know if you noticed, but my friend Martha (comment above) also chose the word mindfulness! You both are such wonderful women with kids at/about my age, lovers of God and grandchildren. And you might already know, but my mama chose “present.” I’m imagining some good overlaps and wonderful conversations about what you’re learning in those “right here” journeys, too. Peace and joy to you and your family in 2014! Hello dear girl in the luxurious bamboo wrapina. :) That photo is brilliant beautiful Ashley! I love this time you spent away and HOW you spent it and I love that you are back! 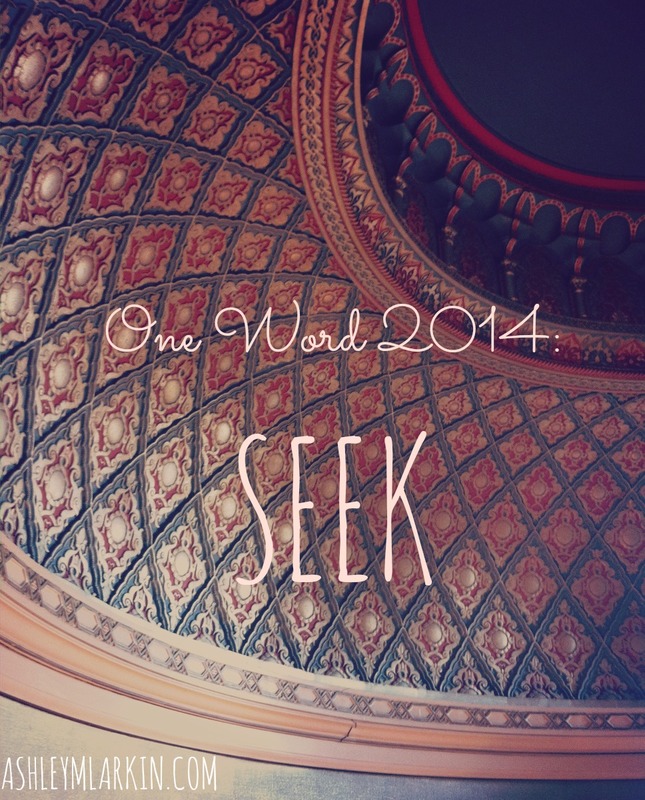 Seek is a good word for you – it’s both where you are and who. And in it, there simply IS no perfection to strive for. I can only imagine and can’t wait to learn what it is you find along the way! My word this year is present. Being a person who has more than a little trouble choosing, I like that this word connotes both a state of being and a gift…(and even the act itself of giving.) Perhaps I’ll learn better what gifts there are in being present. I look forward to learning this year with you! (and from you!) much love! “Present” is such a great word for you, Mama. I don’t know if you already know, but Deb chose “mindfulness.” I can imagine so many applications for you both and such good conversations. I like that “present” is both a freeing and life-giving concept, while also being a containing and grounding one. Ashley, I have felt the word Freedom was calling to me this year. I’m not sure what it looks like…but I know that it means being more involved in both seeking His renewal and releasing in my life, and also being involved in releasing the captives in this world..thru what means I’m not sure. There are some things on my mind, but I’m not sure how he’s calling me in this. I love this oneWord that challenges and takes us on a journey with our Lord, where we could become so consumed in resolutions that often require our own strength and stamina to maintain. Trust is something that I’ve really been struggling with alot lately. I am sure that this mustard seed faith is something that I find myself daily clinging too. thank you for sharing friend…it comes back to HIM and him alone in all things, doesn’t it. This is something that I’m slowly grasping and trying to change my habits in life to incorporate. Love you. First things first. :-) This wrap is wonderful, Janel. If you are ever asked what you as a writer artist might like, I strongly suggest asking for this (maybe a group gift…I have not checked the price). It is Barefoot Dreams (Bamboo Chic Lite), and I do not exaggerate when I say it is a game changer. Part of my “writing uniform” now. Now to other important things. Freedom as both renewal and releasing! Janel, how powerful this is. I see this in you as I’ve followed along on your journey. Yes, friend, for freedom you have been set free — both for yourself and others. I am thrilled to see how God works in your life with this intention. Love you, freedom seeker. Oh sweet friend! It seems you have been feeding my soul long enough now that there is a space that only your words will fill. I wasn’t even aware of how hungry I was until you began to speak! You’ve been missed – but I am so thrilled that it’s been quiet around here for all the right reasons! So excited to see you face to face, friend, and squeeze you! (Maybe at the Faith & Culture Writers Conference?) It’s so amazing, isn’t it, how we grow to find comfort in one another’s words? Such a picture of the Body of Christ — each speaking in her/his unique voice, adding to the chorus proclaiming life…each extending her/his own picture of home where others can find peace, challenge and comfort. Vision sounds like such a great guiding word for you, Karrilee. You are indeed a visionary, and I can’t wait to see how that takes further shape in 2014!